The leading candidate to become Mexico’s next president, Mr Andres Manuel Lopez Obrador, seems to have knocked out his nearest opponent by dubbing the centre-right candidate Mr Ricardo Anaya as “Richy Rich” in the latest debate. In a clearly orchestrated moment, Mr Obrador clinched on to his wallet, hoping to protect it from his rival candidates as he laughed. The debate style appears to have superbly paid off as the latest poll show support for the leftist candidate now stands at a whopping 52% or more than both of his nearest rivals combined. 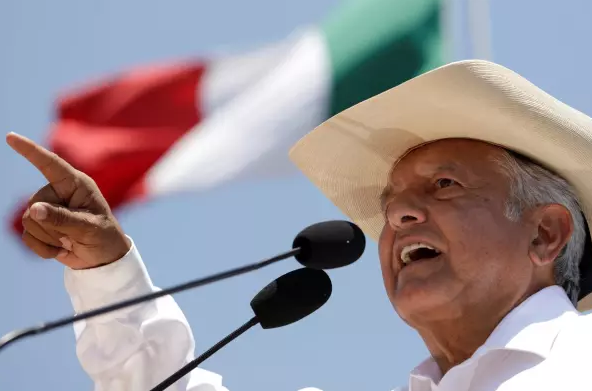 With one month to go before the voting booths open, an Obrador presidency seems all but decided. Because of this, several of Mexico’s leading businessmen are now openly warning their workers against the plans of Mr Obrador. I think it will be Mexico's doom just like Cuba and Venezuela!! We need to build our WALL because more will try to come once it hits their economy!! Yes, build the wall !! !